Find your unique work/life balance, Remain positive and optimistic, Enjoy strong relationships, Set aside perceived pressures, Make the choices that work best for you, Feel empowered and confident! You can thrive during your pregnancy with coaching from Amy L. Riley! Looking for prenatal coaching? Have questions about creating the type of pregnancy you most want? Have specific goals for your birth experience? Amy L. Riley is the authority on making the most of this beautiful time. 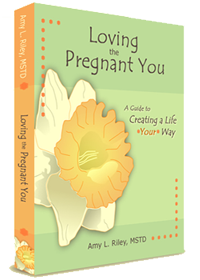 Get your FREE e-Guide: "5 Ways to Love the Pregnant You"
I need a resource for empowering goal setting, pregnancy support and live encouragement before, during and after my pregnancy. I need to learn from other women's experiences to consider what I most want to do, think or consider in regards to an aspect of pregnancy. I need a credentialed and engaging expert to deliver an informative and inspiring presentation to my group, hospital or association. How is a pregnancy coach different than an OBGYN, midwife or doula? A pregnancy coach is not a substitute for a doctor, midwife or doula. These individuals are responsible for monitoring your health and the health of your baby, and making recommendations to support your health. A pregnancy coach supports you mentally and emotionally as you process your thoughts and feelings and work to discover your best way of “doing” pregnancy. You can begin speaking with a pregnancy coach before conception, anytime during pregnancy, or during postpartum recovery. To learn more about who may benefit from pregnancy coaching, please visit the blog!